Offshore Gold, Cash And Notes... Do You Need To Report On An FBAR And Form 8938? | TaxConnections is a where to find leading tax experts and tax resources worldwide. Let’s begin with some basics. A U.S. person must file an FBAR if that person has a financial interest in or signature authority over any financial account(s) outside of the United States and the aggregate maximum value of the account(s) exceeds $ 10,000 at any time during the calendar year. In addition, if those foreign financial assets are owned by foreign entities such as corporations, U.S. persons who are officers, directors, or shareholders may also be required to file forms and schedules with the IRS (e.g., Form 5471 is used to satisfy the reporting requirements of IRC Sections 6038 and 6046 and the related regulations). What is a financial account? According to Treasury Regulation 31 C.F.R. § 1010.350, a “financial account” includes securities, brokerage, savings, demand, checking, deposit, time-deposit or other accounts maintained with a person engaged in banking. In 2011, the regulations expanded the term “other financial accounts” to include commodities, futures, or options accounts, insurance policies with cash value, and mutual funds or similar pooled funds that issue shares available to the general public and that have a regular net asset value determination and regular redemptions. Financial account also includes an account with a person that is in the business of accepting deposits as a financial agency or a person who acts as a broker or dealer for futures or option transactions in any commodity or is subject to the rules of a commodity exchange or association. A foreign financial account is defined as one located outside the United States. 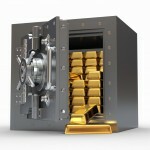 When it comes to gold and currency cash noes, the issue can be framed as follows: “Does gold (or cash notes) stored inside a vault in a foreign financial institution – but leased to a private company – trigger an FBAR-reporting requirement?” Specifically, is a private vault located in a foreign financial institution a “financial account?” If so, then any assets stored inside it – whether they be gold or currency cash notes – must be reported on an FBAR. If not, then these assets need not be reported on an FBAR. Courts have not decided whether a private vault located within a foreign financial institution is a “financial account” for purpose of triggering an FBAR-reporting requirement. Nor has the IRS. In fact, the closest that the IRS has come to weighing in on the issue is a published list of frequently asked questions that does not answer the question directly. Instead, it answers a much narrower question, “Is an FBAR required for an account maintained with a foreign financial institution if the account holds noncash assets, such as gold?” The IRS responded affirmatively, stating that an account maintained at a foreign financial institution qualifies as a “financial account” for FBAR purposes, regardless of whether the account holds cash or nonmonetary assets. The question posed, however, is inherently flawed. Why? Because it tacitly assumes that the assets are being held in a bank account at a foreign financial institution. What is not answered is the question of whether vault space leased by a private company at a foreign bank – and completely segregated from that financial institution’s banking activities – is a “financial account” in the first place. The reason why this is relevant is simple, yet easy to overlook. If a private vault is not a financial account, then any assets stored inside it – i.e., gold or currency cash notes – need not be reported on an FBAR. A review of the treasury regulations reveals a similar result. However, they offer some guidance which provides a helpful “road map” for determining the ultimate question. According to the regulations, a financial account must be maintained by a foreign financial institution. 31 C.F.R. § 1010.350. The operative word here is “maintained.” As subtle as it might sound, this small word has huge implications. Very simply, it highlights a distinction that is critical to the analysis: The fact that a private vault may qualify as a “financial account” does not automatically trigger an FBAR-reporting requirement. What more is required? In order for a private vault to trigger a reporting requirement, not only must it qualify as a “financial account,” but it must also be maintained by a foreign financial institution. Then and only then must a U.S. taxpayer file an FBAR. From this, we can craft a handy-dandy rule: A vault located inside a foreign bank that is leased to a private company – and not maintained by the bank itself – does not trigger a reporting requirement. Let’s consider a hypothetical. Assume that John, a U.S. citizen, stores gold and cash notes inside a vault at a foreign bank, specifically a Swiss Bank. In order to test our knowledge of the “fringe areas” of this obscure rule, let’s add a wrinkle. Although the vault is located inside a bank, the bank does not operate the vault. Instead, it leases the vault to a private company named SafeStore. SafeStore, in turn, assigns reference numbers to each vault. For simplicity sake, let’s assume that this vault falls within the definition of “other financial account[s]” under 31 C.F.R. 103.24. To be sure, no circuit courts of appeal have decided what constitutes “other financial account[s]” under 31 C.F.R. 103.24. However, just because they haven’t doesn’t mean that it is beyond the realm of possibility for a private vault to fall within the definition of “other financial account[s],” especially in light of the fact that at its most primitive level, a vault is a place where valuable items are stored. Like a bank account, a taxpayer who owns assets stored inside a vault controls access to those assets, in the sense that he or she can deposit or withdraw these assets at will. Assuming that the private vault is deemed a financial account, the next issue is whether it is maintained with a “financial institution” or “other person engaged in the business of a financial institution.” Here, there are two sub-issues. On the one hand, in order for the vault to be maintained by a foreign financial institution (or a person engaged in the business of banking), the institution (or person engaged in the business of banking) must be able to exercise control over its contents. In other words, it must have the authority to access and make deposits and/or withdrawals. In a case where unrestricted access is granted by the owner of the assets to the foreign financial institution (or person engaged in the business of banking), that would indicate that the vault is a financial account and that an FBAR is required if the currency notes exceed the reporting threshold. With respect to the first sub-issue, a compelling argument can be made that this arrangement was different than actually opening up an account at the Swiss bank itself. There are three reasons. First, the vault where the gold and cash notes were stored was leased exclusively to SafeStore for the benefit of SafeStore’s customers (one of whom was John), and because the vault was segregated from the bank’s own assets, absolutely no co-mingling of assets occurred. Instead, the notes were held together in a designated area of the vault and individually packaged and labeled so that they were fully identifiable – at all times – as being the property of John. Second, it was not necessary for John to open up an account at the Swiss bank in order to conduct currency transactions. Third, SafeStore clients have continuous access to their gold and cash notes on demand. In order to take possession, John need merely show up. And this is so even in the event of a financial apocalypse where the Swiss government suspends withdrawals in order to prevent the banking system from collapsing. The vaults are outside the banking system and remain accessable at all times. The government has equally strong arguments. First, what cannot be overlooked is the fact that the vault is physically located inside a bank. Indeed, this is the 800-pound gorrilla sitting in the room. And second, the “reference numbers” assigned to each vault are not unlike “account numbers,” in the sense that they uniquely identify each client’s assets. In deciding this first sub-issue, a court is likely to find in John’s favor. Why? The connection between the vault and the Swiss bank is so attenuated that it is unlikely that the account could be considered maintained by a foreign financial institution, Swiss or otherwise. John could argue that he had no reason to doubt the representations made by SafeStore in the contract and that he relied upon them. In so doing, he reasonably believed that SafeStore was not a financial institution. Giving credence to the representations made by SafeStore – i.e., that it is not a financial institution – could it nonetheless be treated as the functional equivalent of a bank? In other words, could it be considered a quasi-bank? Admittedly, this is a grey area. Not surprisingly, the government is likely to take the position that vault-operating companies such as SafeStore are the functional equivalent of a “commercial bank.” See Section 5312(a)(2)(B). In making this argument, they will rely on two cases: (1) United States v. Clines, 958 F.2d 578, 581 (4th Cir. 1992) and (2) United States v. Hom, 2014 U.S. Dist. LEXIS 77489 (N.D. CA 2014). In Clines, the fourth circuit court of appeals held that “[b]y holding funds for third parties and disbursing them at their direction, [the organization at issue] functioned as a bank [under Section 5314].” Clines, 958 F.2d at 582 (emphasis supplied). And in Hom, the federal court held that online poker accounts function as banks, making a person’s online accounts with them reportable. To the extent that SafeStore is deemed a surrogate bank, is the relationship between SafeStore and John, as owner of the assets stored in the SafeStore vault, so analogous to a bank-customer relationship that the vault is maintained by a person engaged in the business of banking? This is another grey area. In support of the argument that SafeStore does not operate as a person engaged in the business of banking is the following. First, unlike a typical run-of-the mill bank account, no interest was paid on the notes or gold. Second, John remains in full possession and control of his gold and/or notes at all times. Under no circumstances can SafeStore comingle them with other clients’ gold or disburse them to a third party. Instead, they are held together in a designated area of the vault and individually packaged and labeled so that they are readily identifiable – at all times – as John’s property. In order to take possession of them, John need merely show up. If the court finds that SafeStore is not the functional equivalent of a foreign bank, then no FBAR penalties will be assessed because John had no duty to file an FBAR in the first place. The final issue is whether John must file a Form 8938, Statement of Specified Foreign Financial Assets, with respect to the gold or cash notes held in the vault. Under Form 8938, U.S. persons holding certain foreign financial assets outside the U.S. – including financial accounts, certain foreign securities and interests in foreign entities – must report those assets to the IRS. I.R.C. § 6038D. As defined by IRC Section 1471(d)(2), a “financial account” includes any depository or custodial account maintained by a financial institution. Thus, the definition of a financial account under FATCA is similar to the Treasury Regulations for FBAR filing requirements. As with the FBAR filing requirements, a reportable financial account for purposes of Form 8938 is defined as an account maintained with a foreign financial institution. In the same way that assets stored in a private vault in a foreign financial institution do not satisfy the definition of a “financial account” for FBAR reporting purposes – assuming, of course, that the financial institution does not exercise control or have access to what lies inside the vault – the same reasoning applies in the context of Form 8938. Specifically, offshore assets do not satisfy the requirements of a “financial account” for purposes of triggering the Form 8938 filing requirement. Do not forget an important point. Even if there is no obligation to report gold or currency cash notes on an FBAR or Form 8938, if the assets are owned by a corporation, partnership or trust, other information returns may be required. Because failing to file information returns related to foreign corporations, partnerships, and trusts carries its own penalties – many of which are equally or more severe than failing to disclose offshore assets on an FBAR or Form 8938 – if you’re not careful it could cost you the shirt off your back. This example highlights the true complexities of the FBAR reporting regime. Because there are no clear cut rules and no judicial decisions to interpret what is otherwise a gray area of FBAR compliance, one can only hope that the IRS will give the taxpayer the benefit of the doubt and view such cases in a light most favorable to the taxpayer. At the end of the day, what is most important is if, upon learning of your FBAR and Form 8938 reporting requirements, you acted swiftly. This proves that you acted in good faith to “get right” with the IRS.